Brother: "[Terrorism] touches everyone no matter who you are"
(CNN) -- Eighteen-year-old Susan El-Baneh and her husband of three weeks died holding hands, her brother said, victims of a terrorist attack Wednesday on the U.S. Embassy in Yemen. 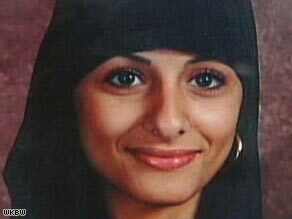 American citizen Susan El-Baneh, 18, and her Yemeni husband of less than a month were killed in the attack. The Lackawanna, New York, native, a high school senior, had gone to the Arabian Peninsula country a month ago for an arranged marriage. She and her husband were in the waiting area of the U.S. Embassy in Sanaa, trying to find out the procedure to bring her spouse back to the United States. Susan El-Baneh was the only American killed in the attack. Some of El-Baneh's family members, who had traveled from Lackawanna with her for the wedding, heard the blasts of the coordinated terrorist attack echo through the city's walls. When they called to find out what happened, the relatives were told that 16 people, including the attackers, had been killed, her brother Ahmed El-Baneh told CNN on Thursday. Among them were an unidentified man and his wife. Susan El-Baneh's uncle rushed to the hospital to see the bodies. "He just knew it was them," Ahmed El-Baneh said. The couple was still holding hands, he said. Susan El-Baneh had traveled to Yemen 30 days earlier with younger brother and mother, who gave her away during the wedding. "She was so excited, so happy to be getting married," Ahmed El-Baneh said. "She was going to go there and try and bring her new husband back to the United States after paperwork was done and then complete her last year of high school." Ahmed El-Baneh said he spoke to his sister about the wedding two weeks ago. "And for the first time in my life I told my sister I loved her," he said. The woman's family had thrown her a shower before she left for Yemen on August 17, and she couldn't have been more excited about the wedding, her brother said. "It was like you have to, you have to do this," he said. "The wedding was going to be so wonderful. There wasn't any -- you aren't going to be invited -- the whole village was there." Susan El-Baneh probably was going to come back to the United States in December, her brother said, or whenever the paperwork for her new husband was cleared. She planned to finish her final year at Lackawanna High School and then go on to study to be a nurse. "She was a very outgoing person, and she did anything to help out her family," her brother said. "On top of that she was taking advantage of the times now when a Muslim lady can go to work, doing what they want, not just being housewives. She was going to get her education and be successful." Lackawanna High School principal Peter Hazzan told CNN affiliate WIVB-TV in Buffalo, New York, that grief counselors met with students Wednesday. "The news hit hard today. It was devastating for many of the Arab-American students," Hazzan told WIVB. "Many of them are still grieving, and many were actually sent home." El-Baneh's wedding was a source of pride for her family as they celebrated the holy month of Ramadan, a time in which Muslims believe the Quran was revealed and presented to the Prophet Mohammed. "But if you die in the month of Ramadan, you go straight to heaven, and that is where my sister will be," Ahmed El-Baneh said. "But anyone that did this cowardly act, they will go straight to hell." Susan El-Baneh is related to Yemeni-American Jaber El-Baneh, who is on the FBI's most-wanted list, accused of being the seventh member of the Lackawanna Six. The six were convicted or providing material support to al Qaeda. El-Baneh confirmed the relation but preferred to talk about his sister and how the attack proved anyone can be the target of a terrorist act. "It touches everyone no matter who you are," he said. Muslims are supposed to be peaceful, he said, and those who committed the attack on the embassy in Yemen only smear that view. "They say they do this for a cause, but there is no cause," he said. "A cause is when you sit down and talk, not when you kill millions and millions of people, now including my sister among them. What is the cause for that?"